For a book called Spectacle, Steinberg’s slim short story collection displays a notable lack of interest in surface events. Many of its situations are explosive and overwhelming – plane crashes, turning off a parent’s life support – but these stories turn inward rather than outward. Steinberg’s focus is on internal turmoil, and her staccato rhythms and disjointed narratives don’t offer the reader any easy options. Fans of the traditional short story may want to look elsewhere. If you’re open to literary experiments and structural minimalism, however, then Spectacle comes close to delivering on the show-stopping promise of its title. The stories weave in and out of each other in dreamy fashion, with characters recurring, events echoing through other narratives, and themes bleeding into each other. The overriding style is stripped-back and confrontationally frank. Some passages read more like prose poems than conventional narratives. 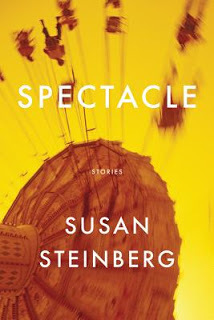 In the title story, ‘Spectacle’, the narrator shares interconnecting recollections of plane crashes and casual liaisons in sparse one-sentence paragraphs. There are even repetitions in the subject matter, with some of the stories (‘Cowboys’ and ‘Cowgirl’, ‘Supernova’ and ‘Spectacle’) retelling the same narratives. The structure and style are altered, but the details remain the same. Steinberg circles round and round her subjects as she searches for a core of truth. Spectacle‘s narrators are both confessors and accusers, and their voices are so consistent that there’s an unconfirmed implication that we may be listening to one voice. The internal landscape she paints is navigated via moments of suffering and loss. In one story the narrator recalls being on the receiving end of what may or may not have been domestic abuse; in another she imagines the widespread devastation of a major plane crash. Nobody is happy or fulfilled. The tone is overwhelmingly bleak. Even situations that might be expected to inspire happiness – sleeping with a new lover, partying with friends at a nightclub – are tainted with disappointment and self-doubt. This is everyday life at its rawest. Steinberg constantly challenges gender stereotypes, but her approach is investigative rather than prescriptive, opening up wounds to see how the pain affects us. The narrator explores her strained relationship with her father, her ill-advised sexual exploits in her youth, her ambivalent feelings towards her boyfriend. She asks over and over again what it means to be a girl, or to be a guy, or to be this girl, or that guy. It’s well-trod territory, but in her refusal to offer easy answers or indictments the author demonstrates a rare grasp of the issue’s complexity. Gender politics turns out to be nothing more than a series of masks we wear, as we struggle to define ourselves in the world. There is no intentional metaphor in this story. There is no intentional meaning in this story. I would not subject you to intentional meaning. I would not subject you to some grand scheme. This might be read as a manifesto for the collection as a whole, an overriding principle that gives it its distinctive voice. There are no easy solutions – simply an honest representation of life as the author sees it, with all its confusion and misery intact. This challenging approach makes for tough reading at times, and it’s experimental enough that it constantly flirts with failure. The minimalist repetition itself becomes repetitive. The recycling of themes, events and prose styles suggests a thinness of material. But Steinberg is too smart to allow her experiments to fail so easily. In ‘Supernova’ the narrator tells us how she wanted to be a tightrope walker: “I wanted to be between living and not living. Just for the time it would take to walk the tightrope… I knew to hold the stick steady. I knew to force the crowd to be silent. And then, when I reached the other side, I knew to force it to explode.” Steinberg is one of the most daring tightrope walkers we have seen in a while. Whether she ultimately steadies herself or falls, her latest collection never fails to amaze.